There is one identified and two unidentified burials of the Great War in Arleux-du-Nord Communal Cemetery. The graves are located on the north side of the cemetery. 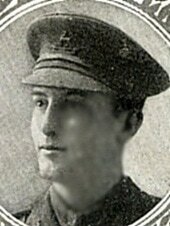 16th March 1918, aged 21. Son of Sir S. W. Knaggs, K.C.M.G., of Trinidad, British West Indies, and Lady Knaggs.